Do you do the big New Year’s Eve party thing? I know that holiday tradition has shifted for a lot of us now that we’re moms! Whether you throw a party with other families or stay home with your own kids, it’s fun to close out the holiday season with a New Year’s Eve exclamation point. These easy New Year’s Eve craft ideas can be made ahead of time in that after Christmas lull, or let the kids create them at the party, as an activity or favor. Get set for your holiday party with these 23 Must Try Recipes your guests will love. These 15 Genius Recipes to Make this Winter are a must see. Get your DIY on with these Easy DIY New Year’s Eve Decorations. Check out these New Year’s Party Ideas for Kids! There are some great poppers: DIY Confetti Poppers, Easy Party Poppers, and Confetti Popper Toilet Paper Tubes and several fun noisemakers. There’s even a Noisemaker Centerpiece. 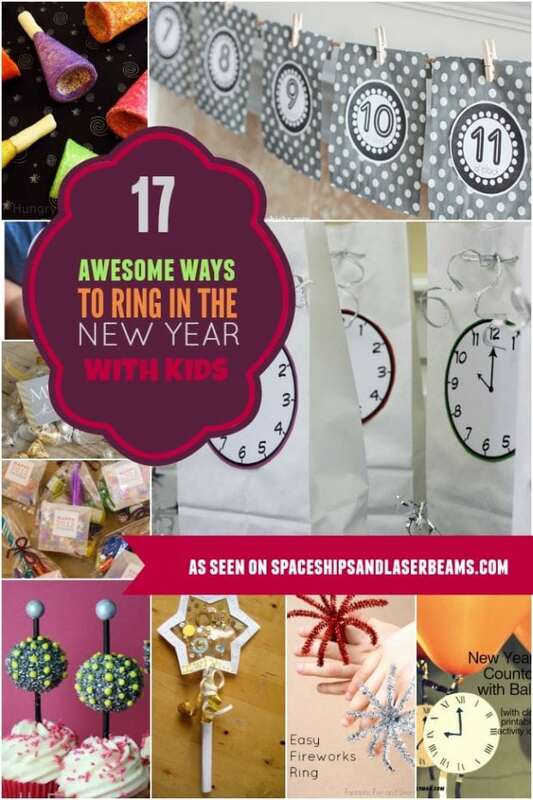 The ball drop is an important part of any New Year’s Eve celebration, so you’ll want to have a DIY New Year’s Eve Ball, Cupcake Liner Disco Ball, New Year’s Eve Countdown Craft for Kids, or New Year’s Eve Ball Drop Craft! The Bow Tie Glasses, New Year’s Eve Tic-Tac Printable, DIY Happy New Year Garland, Paper Fortune Cookies, and New Year Wreath make great party decorations. The Fireworks Painting, Paper Plate Party Animal, Fireworks Ring Craft, and Wishing Wand are fun activities the kids can do while waiting for the midnight hour. I love these sparkly New Year’s Eve balls! Cut some glitter paper into strips (color of your choice), and fasten them at the top and the bottom, then fan them out and hang them around the house at various levels! These DIY noisemakers are perfect to make with kids for the big countdown! Your kids can customize their own noisemaker and when the countdown happens it’s time to make some noise. When it’s time to go home, your guests can take these colorful crafts as perfect party favors. These elegant bowtie glasses are perfect for celebrating the new year. They work as a great addition to a beautiful table spread for your new year’s party, or as a fun craft for the kids. You can cut them out of any type of felt or cardstock, and have your kids decorate them to their own taste. When it’s time to make your toast, fill them with some sparkling apple juice for the kiddies, and champagne for you. These confetti popper rockets let your kids blow stuff up inside, without the fire hazard! The confetti is inside of a trapdoor attached to a string. When pulled, the confetti comes streaming out of them for a fun and innovative twist on a classic confetti popper. Decorating them is super fun for your kids to assist with, almost as fun as setting them off. Celebrating the new year with fireworks has always been a classic. With these fireworks paintings, your kids can let their creative sides fly. Create these awesome fireworks pipe cleaner rings, dip them in paint, and press them against black cardstock. Simple and fun for everyone. All New Year’s Eve parties should have a beautiful centerpiece. This centerpiece doubles as party favors for your guests and children once the clock strikes midnight. Just add some noisemakers to your cake stand and surround them with some sparkly tinsel. Just use glasses to stand up anything that won’t stand up on it’s own. 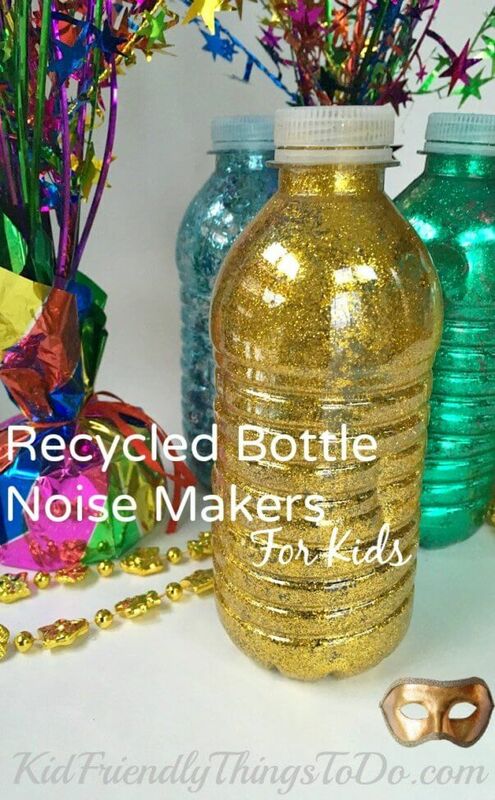 These recycled water bottle noise makers are the perfect way to get you and your kids in to the celebration mode for the new year. They’re a lot of fun to make and you already have most of the items on hand. These homemade party poppers are great for giving the people at your celebration a great surprise. Wrap your toilet paper roll in some fun and colorful tissue paper, and then fill them with various trinkets, confetti, and surprises. Tie them up, and hand them out for everyone to pop open during the countdown. These are seriously adorable. Your kids can create an awesome paper plate monster, and the tongue is a party blower. To keep the grown-ups happy, you can easily find silent party blowers to use for these. Your kids can pick out the colors they want to use for their monsters, too. You could even give them names and backstories as an activity to keep them entertained until the countdown. Who says that all of the flashy glitz and glam has to be in the decorations this year? These easy fireworks ring are so much fun for the kids to make. All you need are sparkly pipe cleaners! Once they get one down, they’ll be making another one… for each finger. You can change up the colors of the pipe cleaners too for multicolored fireworks. This fun craft is a great way to help your children reflect on the year they have had, and helps them to think of the coming year and create awesome resolutions, hopes and wishes for it. Decorating the wand will be a lot of fun for them. Having someone to smooch when the clock strikes midnight is something a lot of people try to do. It’s actually become a huge tradition around the world. These printables are easy to affix to tic-tac boxes to make sure that your breath is 100% fresh for your special someone when the countdown happens. These noisemakers are perfect to get you and your kids out of the post-Christmas blues and into the next year. They’re super easy and fun to make, and even more fun to use. You can spray paint the raisin boxes, or cover with construction paper. Have your kids decorate their boxes for the celebration. This flashy disco ball is easily made with shiny foil cupcake liners. Just glue them to a large ball (Styrofoam, paper lantern, etc.) and then hang the ball up somewhere that it will catch the light in your house. This garland looks so perfect strung up in the house during your celebration. You cut out the ribbon background pieces from scrapbook paper and attack some glittery letters to each one. Then, they’re easily attached to the string using cute little clothespins! I love that you can customize these to fit the other décor in your house for your celebration, just change up the colors you use! Another great way to keep your kids entertained until the big countdown is goodie bags. These printable clocks are so cute. Just get your New Year’s Eve activities and some lunch bags, and have your kids open each surprise bag as the night goes on. You can personalize each bag for different kids and age groups too! This craft is so much fun for kids to create, cut, paste, and color. I love the idea to create a printable, it really takes all of the work out of the project so you can focus on the time with your loved ones! Party poppers are the perfect way to bring excitement into your New Year’s Eve celebration. These party poppers use leftover toilet paper rolls so you can feel even better about recycling. The balloon on the end makes setting them off a lot of fun. You can even have your kids help decorate them in the hours leading up to midnight. These adorable paper fortune cookies are so much fun to make. You can create New Year’s fortunes for each cookie for people to open. They even include printables to make both the cookies, and fortunes in the instructions. Your kids will love reading their fortunes as the New Year approaches. Ring in the new year with these fantastic New Years Eve party ideas. From glitter confetti garlands perfect for a photo booth, to edible glitter dusted fortune cookies, these easy party DIYs are sure to be a hit with your guests. Celebrate with more great ideas for a family friendly New Year’s Eve party.